Plans by Onxley Architects to convert the current main building into a gym with a performing arts stage. Currently, Lake Pointe has neither a gym nor a regulation sports field on its campus. Following is a snapshot of LPA's facility plans, present, future, and past. Practices are held at Allison Creek Presbyterian Church, less than 2 miles south of campus on Hands Mill Hwy (Hwy. 274). Event locations vary by host and date. Girls' volleyball practices and home events are held at the gym of Lake Wylie Christian Assembly in Lake Wylie. Home games are scheduled at the gym of Lake Wylie Christian Assembly in Lake Wylie. Practices are held in two locations, including Lake Wylie Christian Assembly in Lake Wylie and Allison Creek Presbyterian Church two miles south of campus on Hands Mill Hwy. (Hwy 274). The academy is very grateful to these gracious hosts. Fall (boys') soccer home matches and practices are both scheduled at Oak Ridge Elementary, four miles east of campus in Lake Wylie. Golf practices and home matches are scheduled at Spring Lake Country Club in York. LPA's campus has three small fields that allow for flag football, ultimate frisbee, outdoor volleyball, and other recreational sports. 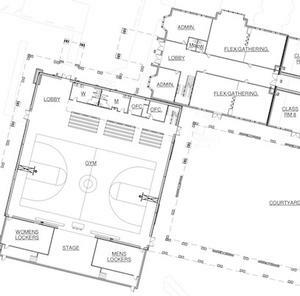 Architectural drawings, currently in planning and estimating process, provide for a future campus gymnasium, to include exercise, weight training, and locker rooms. In addition, the plans provide for the space to be utilized for performing arts practices and events, thanks to the addition of a larger stage, dressing rooms, and supporting AV and lighting equipment. Since the athletic program was begun in fall of 2008, Mariner sports teams have relied upon the provision and cooperative support of several local churches and organizations. We are deeply grateful for these organizations and their leaders for supporting Mariner sports. They are a testimony to generosity.